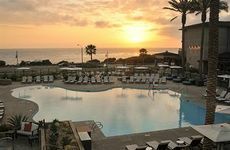 Find Cape Rey Carlsbad, a Hilton Resort deals, discounts and special offers. Set among lush gardens, La Costa features two sparkling pools, full spa amenities, golf courses, and teen lounge. West Inn and suites has 86 rooms including 36 suites, refreshing pool, fine dining & fitness center. This hotel offers free continental breakfast and feaures an on-site spa. The 251-unit Grand Pacific Palisades Resort is located on a ridge overlooking the Flower Fields at Carlsbad Ranch. This oceanfront hotel features in room refrigerators and an outdoor swimming pool and hot tub. The resort offers both rooms and condos and has a pool, gym, children's play area, and hot tub. Golfers will find the hotel to be conveniently located to area golf courses. It is also close to SeaWorld. The hotel has a convenient location to McClellan-Palomar Airport, and local attractions, such as Legoland. This smoke free hotel is located steps away from points of interest such as Legoland, Wild Animal Park and Disneyland. This beachfront resort offers access to many outdoor activities, such as fishing, bird watching and nature walks. Located close to the North County coastal area, the hotel allows easy access to Legoland and SeaWorld. This hotel is conveniently located in the middle of the business district, but also close to the beach. The Spanish Mediterranean-style resort is conveniently located to Legoland, and The Crossings at Carlsbad golf course. An upscale seaside resort on 200 secluded acres. Featuring fine dining, swimming pools and a spa.